To my surprise, Geron has participated in the recent biotech upswing. Imetelstat's path to development is a work struggling to restart. Geron's new role will entail constant funding pressures. 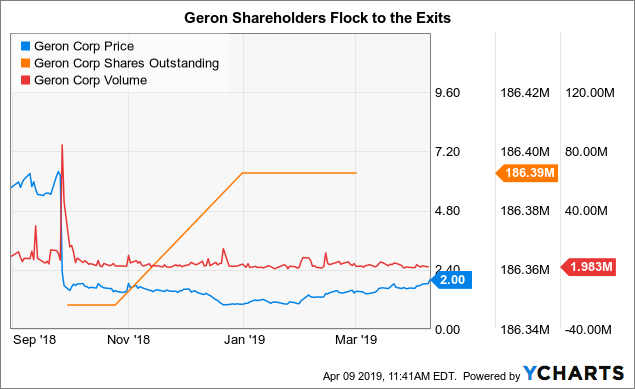 Geron (GERN) is a stock that endured extreme turbulence during the closing months of 2018. I chronicled its saga with a series of articles advancing the bull side of an acknowledged binary outcome matrix; the opposite side prevailed as described in "Geron's Last Hurrah?" This article describes Geron's prospects going forward now that the smoke is starting to clear. Geron's price action this past 6+ months has been severe. When Johnson & Johnson (JNJ) subsidiary Janssen elected to discontinue its imetelstat collaboration on 9/27/18, shareholders flocked to the exits. Surprisingly, I have noticed that Geron share price seems to be crawling back, despite its lackluster 3/7/19 earnings CC for Q4 2018. 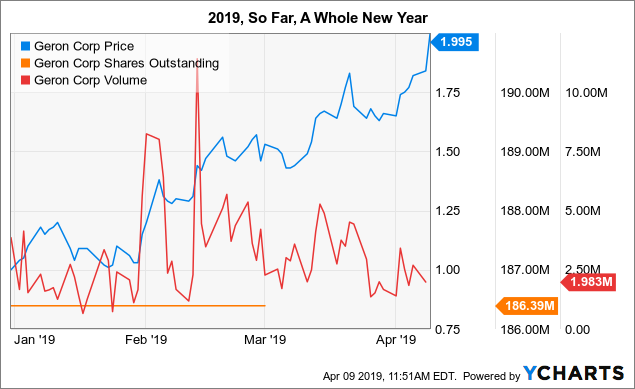 When one takes a look at the company's share price, count and volume for just 2019, per the chart below, it suggests that investors see some cause for optimism. Is this optimism merited? That is the question I will try to answer. My read of the Q4 2018 earnings CC tells me that Geron has a long, difficult slog ahead of it. There do not seem to be many way stations along the way where it can rest in the shade of non-dilutive cash infusions (cash). ... a 35% reduction of spleen volume, or SVR, and a 50% reduction of the total symptom score, or TSS. Despite the fact that in IMbark imetelstat showed a clear survival advantage for very sick patients who had failed ruxolitinib, it has no clear path to advance to a pivotal MF phase 3 trial. At this point, Geron is unsure as to its best future course for imetelstat in treatment of MF. Accordingly, the company's current approach to MF is unsettled. Our decision whether to continue late-stage development in MF will be influenced by our assessment of what would likely be require to achieve clinical success in regulatory approval including the cost and duration of any potential clinical trials. To inform this assessment we will conduct discussions with key opinion leaders over the coming month and we expect discussions with regulatory authorities to begin after the IND is transferred back to Geron. ... [it acquires] control of the operational responsibilities for the imetelstat program back to Geron, including sponsorship of the IND and ongoing clinical trials, contractual commitments, patient databases, drug inventory and manufacturing, preclinical information, biometrics and regulatory filings [from Janssen]. During the Q4 2018 earnings call, Geron added color to this process. CEO Scarlett expects to complete the transfer in 2019. Towards that end, the company is more or less starting from scratch, after years of operating with a skeletal workforce of under 20 during the Janssen collaboration. Now it is hiring executives, including Israel Gutierrez, who joined as Vice President of Pharmacovigilance and Safety, and Aleksandra Rizo as Chief Medical Officer. [work] with her ex-Janssen colleagues as well as members of our team to ensure that all aspects of the IND transfer are on track and that we are fully up to speed on all elements of the clinical data. In addition, she's been very involved with the planning for the start of the Phase 3 MDS clinical trial, as well as meeting with KOLs as part of the transition from Janssen to Geron. And of course she is extremely busy with recruiting activities. We anticipate that Aleksandra will likely join us on future conference calls. We have never derived any revenue from the sales of any products. Our operations to date have been limited to organizing and staffing our company, acquiring, developing and securing our technology, undertaking non-clinical studies and early stage clinical trials of imetelstat and past product candidates that we have subsequently discontinued, and engaging in research and development under collaboration agreements. We have not yet demonstrated an ability to obtain regulatory approvals, formulate and manufacture commercial-scale products, or conduct sales and marketing activities necessary for successful product commercialization. Consequently, for these and other reasons discussed elsewhere in these risk factors, it is difficult to predict our future success and the viability of our business and the imetelstat program. Before we can seek to obtain regulatory approval for the commercial sale of imetelstat, multiple clinical trials, including larger-scale Phase 3 clinical trials, will need to be conducted to demonstrate if imetelstat is safe and effective for use in a diverse population... As such, we do not expect imetelstat to be commercially available for many years, if at all. Our clinical development program for imetelstat may not lead to regulatory approval from the FDA and similar foreign regulatory authorities if we fail to demonstrate that imetelstat is safe and effective... 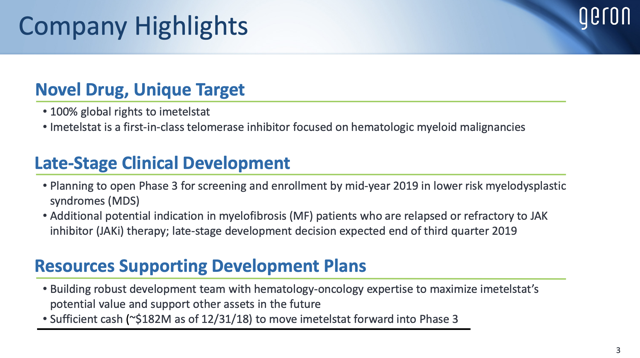 Even if we do successfully complete one or more future clinical trials of imetelstat in hematologic myeloid malignancies, including the Phase 3 portion of IMerge, those results are not necessarily predictive of results of future pivotal trials that may be needed before we may submit an NDA to the FDA for the initial or other future indications. We may therefore fail to further develop or commercialize imetelstat. According to company CFO Bloom's report during its 3/7/19 Q4 2018 earnings CC, Geron guides for operating expenses of $65-70 million for 2019. This is insufficient to take it beyond 2020 as would be necessary to commercialize imetelstat. After a fraught and unprofitable stretch as a Geron shareholder, I have elected to disembark this particular vessel. I have gone full circle - from a strong advocacy for its captain, CEO Scarlett, to a grave concern that he has lost his bearing. 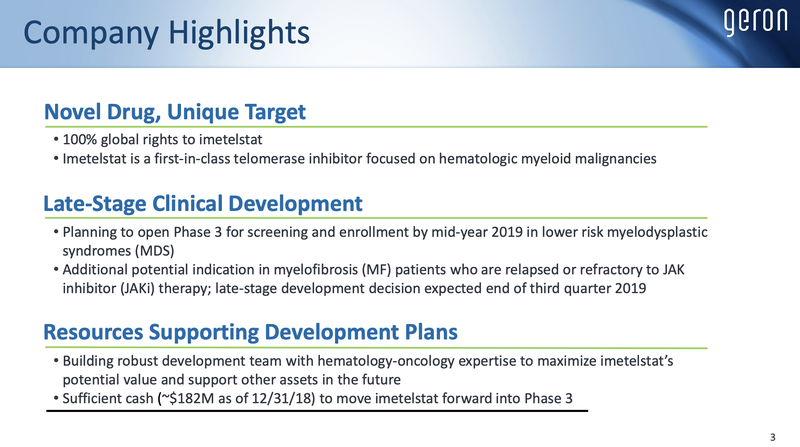 In reaching my decision, I continue to assume that imetelstat offers significant therapeutic benefit in treatment of certain hematologic myeloid malignancies and has potential for a far broader mandate. Unfortunately, its efficacy is not the issue of prime significance to Geron shareholders at the current moment. The issue is whether or not the company is on a course that will yield compelling positive returns measured against risk of capital loss. My assessment at this time on this point is negative, ergo my decision. I was quite bullish all the way through the chutes as Janssen waited to deliver its fateful verdict. Perhaps my recent decision to exit my admittedly modest position will again turn out to be wrong-footed. Time will tell. My decision rests primarily on the concern that existing shareholders will experience ongoing dilution as Geron sells additional shares to fund its continuing operations. In any case, I wish nothing but the best for those hardy souls who continue as Geron shareholders. GLTA, especially patients who are counting on imetelstat to succeed in its clinical trials.